Neanderthals and Denisovans were closely related. 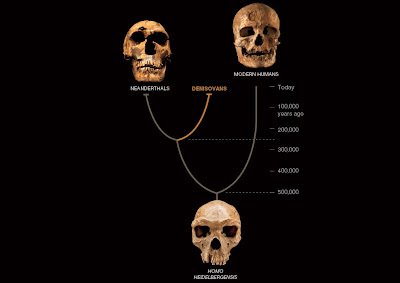 DNA comparisons suggest that our ancestors diverged from theirs some 500,000 years ago. Scientists from the University of Adelaide in Australia and Pthe Natural History Museum in the UK have proposed that human ancestor, Denisova hominins, managed to travel from Indonesia on the way to Australia and New Guinea and interbred with modern humans on the way. DNA studies show that Denovan DNA is not present in indegnenous humans at the northern asian region where the first of the species have been discovered but were prevalent in Australia, New Guinea and surrounding areas. This observation means that Denisovans have managed to cross the Wallace line, one of the world's biggest biogeographic barriers which is formed by a powerful marine current along the east coast of Borneo. The Denisovan species were discovered from a 41,000 year old finger bone fragment of a juvenile female found in the Denisova Cave in the Altai Mountains in Siberia, a cave which has also been inhabited by Neanderthals and modern humans. It is believed that Denisovans have coexisted in Asia with Neanderthals and early modern humans. Denisovans are defined so far only by the DNA from one bone chip and two teeth and is generally referred to as the "Third Human". Scientists have proposed that the most recently discovered ancient human relatives -- the Denisovans -- somehow managed to cross one of the world's most prominent marine barriers in Indonesia, and later interbred with modern humans moving through the area on the way to Australia and New Guinea. Three years ago the genetic analysis of a little finger bone from Denisova cave in the Altai Mountains in northern Asia led to a complete genome sequence of a new line of the human family tree -- the Denisovans. Since then, genetic evidence pointing to their hybridisation with modern human populations has been detected, but only in Indigenous populations in Australia, New Guinea and surrounding areas. In contrast, Denisovan DNA appears to be absent or at very low levels in current populations on mainland Asia, even though this is where the fossil was found. "In mainland Asia, neither ancient human specimens, nor geographically isolated modern Indigenous populations have Denisovan DNA of any note, indicating that there has never been a genetic signal of Denisovan interbreeding in the area," says Professor Cooper, Director of the University of Adelaide's Australian Centre for Ancient DNA. "The only place where such a genetic signal exists appears to be in areas east of Wallace's Line and that is where we think interbreeding took place -- even though it means that the Denisovans must have somehow made that marine crossing." "The recent discovery of another enigmatic ancient human species Homo floresiensis, the so-called Hobbits, in Flores, Indonesia, confirms that the diversity of archaic human relatives in this area was much higher than we'd thought," says Professor Stringer, Research Leader in Human Origins, Natural History Museum, in London. "The morphology of the Hobbits shows they are different from the Denisovans, meaning we now have at least two, and potentially more, unexpected groups in the area. "The conclusions we've drawn are very important for our knowledge of early human evolution and culture. Knowing that the Denisovans spread beyond this significant sea barrier opens up all sorts of questions about the behaviours and capabilities of this group, and how far they could have spread." "The key questions now are where and when the ancestors of current humans, who were on their way to colonise New Guinea and Australia around 50,000 years ago, met and interacted with the Denisovans," says Professor Cooper. "Intriguingly, the genetic data suggest that male Denisovans interbred with modern human females, indicating the potential nature of the interactions as small numbers of modern humans first crossed Wallace's Line and entered Denisovan territory."